Jon Anderson has released a video for his new single Makes Me Happy. The song has been taken from the vocalist’s upcoming album 1000 Hands which will be released on March 31. 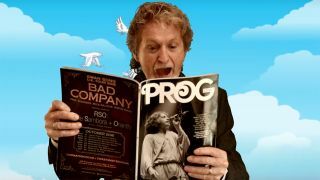 The promo shows Anderson looking through various magazines, including our very own Prog magazine, which he’s handed at the beginning of the video. Anderson tells Rolling Stone: “I am very excited for people to hear and see this crazy wonderful video, created by my daughter Deborah and my wife Janee on the spur of the moment one day at home. He finished the record in Florida with producer Michael T Franklin and it’ll feature Anderson’s former Yes bandmate Steve Howe, Jethro Tull’s Ian Anderson, Steve Morse, Billy Cobham, Chick Corea, Rick Derringer, Pat Travers, Jonathan Cain and Jean-Luc Ponty. Anderson, who recently said he was “very open” to a reunion with Yes, is about to head out on the Past Present Future Tour across the US.